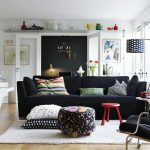 Every one of us has a moment in our life when we are bored of our battered chairs, old vintage couch and tattered brown shag from our early days and have that sudden urge to just renovate the whole house. When such moments come we fall short of ideas as to what should be elegance and what should be shabby. 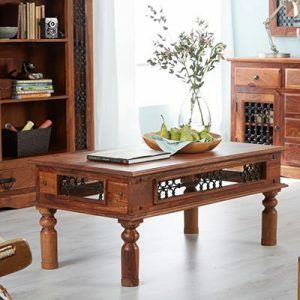 Here are list of great and innovative ideas to rejuvenate your room. Not Flashy but Elegant- It’s really hard to make the ambiance of a room elegant and avoid being flashy. You should try bringing in colours and glitters but not way too much that it turns out to be a shining star at night. 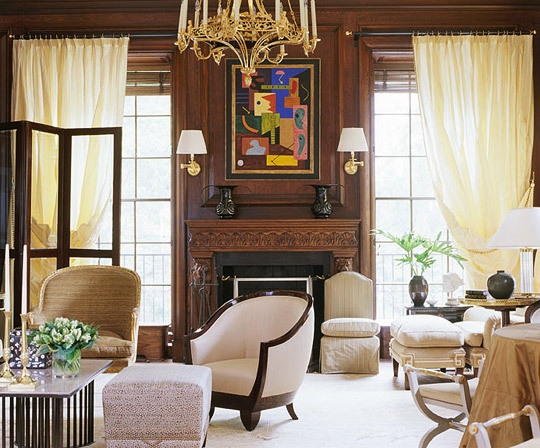 Here is an example of a great living room by designer Skip Sroka, it has the required element of traditional touch along with gentleness of sophistication. The sofa chairs has this curvy back and rolled up arms that gives it a traditional look and shouts royalty from all side. The window curtains gives the setting a calming gesture with its Roman shades with fine blending of pleated silk panels with tone to tone hues. The curves of the curtains and sofas make the whole area a shapely beauty and merge everything in the room. 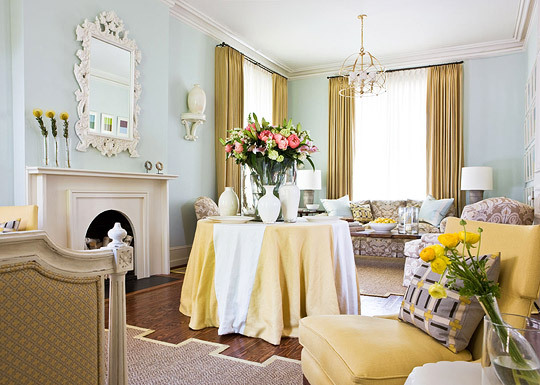 The beauty of the room along with the palette and coffered ceiling shows the essence of charming décor. Subtle Classics- This fireplace by designer Skip Sroka in this Washington DC living room explains to you in details how to create elegant space in even a corner of the room, like this fireplace view. The fireplace looks more stunning with the gold leaf mirror ornamented with Greek motif and classic patterns. 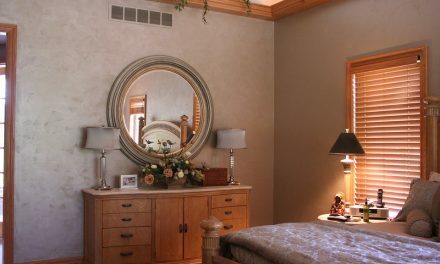 The mirror in a way gives the whole space a much needed classic twist with patterned lines. When the mirror swings over, you can see a flat screen TV and this type of hidden function shows the elegance of decoration. The entire area gives it a royal touch with the symmetrical couple of vintage sconces that adorns both side of the mirror. Living room should be as cosy as possible– This Atlanta home by designer Lori Tippins shows that a room need not be square to be elegant. This cosy living room shows that designs speak a nature of their own and the people surrounding it bring the true essence to its elegancy. Where beauty starts with the materialistic stuff around the room. The French doors of the room accentuate the natural light symmetrically balancing the proportions of the room and the vision of the vintage style marble fireplace. The magic of the scenery lies upon the astounding fireplace playing the role of the focal point and merging everything with it. Every inch of the setting looks picture perfect even the lines of the curtains rods though placed high on the wall. The room has minimum elements of décor yet it sprinkles with such beauty. She converted the floor lamps from gilded iron candlestick which is an innovation and charm of its own. The colours, palettes and patterns of the drapes provide the whole scenario a dramatic presence, completing everything and making it a masterpiece of its own element. 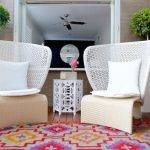 Summer coolness all together-Designed by Noel Jeffrey, this renowned Kips Bay Decorator Show house has an innovative twist that you never thought could be done. The whole setting of the room is out of the blue and doesn’t follow any rulebook. 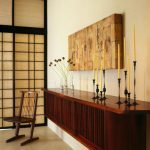 The room’s original woodwork does the magic and by letting it be the focal point, he made us wonder how a room could look so elegant ad warm at the same time. 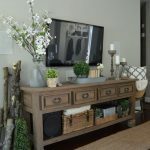 He didn’t put one drop of paint of the walls and the fireplace, letting them stay as it originally should be and just made the base to embrace the wood’s richness. 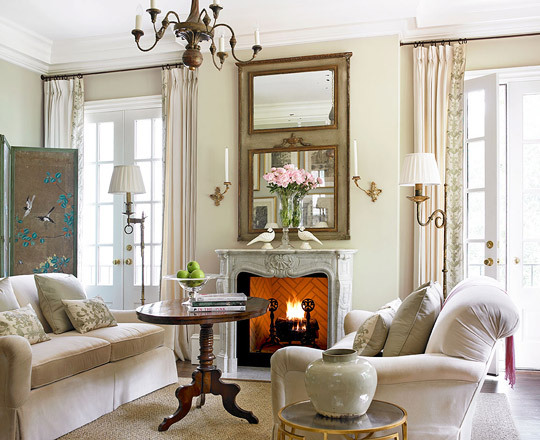 He knows by heart what one would feel when you say warm and completeness and by adding the creamy upholsteries, the fluffy shaggy white rug and the silk beige drapes everything comes into one place and just allows the required contrast to the whole room. Architecture at its best- You must have seen the movie Something’s Gotta Give and if you are a lover of interior décor, you might have fallen in love with the Hampton’s house. If you did love it then this Seattle living room with its bright combination would sure make you fall in love again. Sophistication is marled everywhere in the room yet when you focus, you find it simple and effortless. An architectural marvel one would call it with its crispness and charm. The coffered ceiling with the fireplace installed in the middle and finely stacked shelves on both side defines the bold and linear strokes of the home. The fine art work over the fireplace gives the whole space a new meaning of creativity as well as a formal structure merged with balance in an informal style. Magical Blue– This seaside home designed by Jack Fhillips is so ethereal that you need to wonder how a place could look so precise and elegant. Sophistication settles in every corner of this blue paradise and as said by the designer himself, you only know the true essence of a place when you test them. This Shippan Designer ShowhouseIn Stamford is compiled of all the blue shades which otherwise might have looked gaudy but with the combination of blue with white painted dentil crown mouldings give the whole appearance a different perspective. 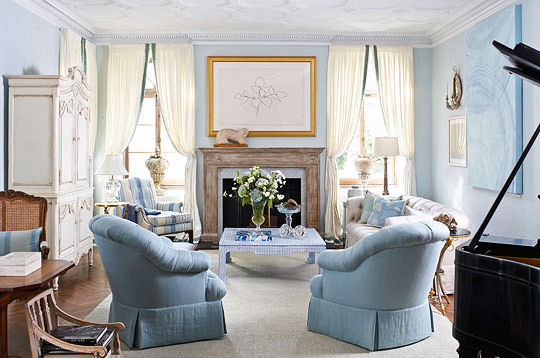 The conversation area looks commanding with the tufted sofa which though looks formal but with the addition of the blue crab chairs makes the setting easy. Light and sunny– Sometimes when you want to get everything in their right place, instead of creating chaos you should just let it be the way it is. Exactly like this East Hampton house which has the perfect decorating ideas without any major changes. If your living room is blessed with large French windows like this room, you don’t need to worry about bright and beautiful. Here designer Larry Laslo left the windows empty and gave the whole focus of the room to the upholsteries. He combined soft pearl and sand monochrome with ethnic wooden touch and enhanced the whole architectural beauty. Royalty with Red– Can you imagine a room that has red elements all over it and yet it shouts royalty? Yes we can, red and royalty goes hand in hand and in this Honolulu Home by Marion Philpotts Miller shows us how. Though she being a music lover, the addition of the grand piano brings in a sense of finery but the addition of the visual arts give the whole sophistication of the room a modern twist. The chandelier in the middle of the room gives the complex and edgy elegance to the room. Patterned look– This Atlanta home takes patterned look to a new level by its subtle tome on tone touch. The room’s pattern is created with texture and it can be used both as family room as well as living room. The fireplace is adorned with the modified wing chairs and with diamond motifs weaved into the beige fabric of the chairs gives the whole appearance a charming royal look. 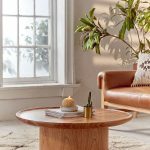 Designer Amy Bergman has gone into details with the creation of each and every corner of the room, like the inside of the fireplace which has the herringbone pattern bricks laid down which is just subtle. You can see a 3D wheel pattern fauteuil facing the fireplace which is made from a velvet taupe. The chandelier in the middle with its candle stand gives the space a very traditional feeling and to add charm to the texture game, the diamond studded sofa and club chair does the work. With everything in patterns and textures, to balance the setting the decorative pillows are placed. In whole the place is quiet, elegant and homely at the same time. 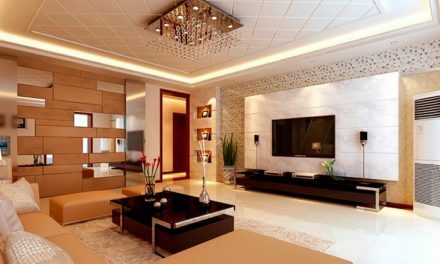 Homes with such elegance and magic are rare founds and one need to have a creative prospect to turn any ordinary living room to this majestic world. 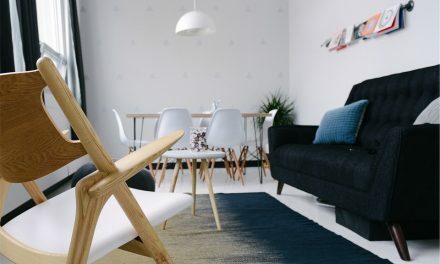 With just minute silly details anyone could turn their home to a designer gallery, all you need to give the detailing a little more interest and understand the combination of textures, patterns, colours and sizes.